Mary E. (Gaddis) Strader born August 1865/66 was the daughter of General Jackson Gaddie and Ellen Fox. She married James Strader in Hart County Kentucky in about 1891. She had ten children, three died stillborn. She and husband James, married in about 1891, migrated to Lyons Kansas, Rice County, about 1900 (based on children’s births). Mary E. died June 17, 1968 in Ellsworth, Kansas. Our memories, true or not, are part of our family history. Of course verifying the facts are vital, but the memories should not be forgotten. 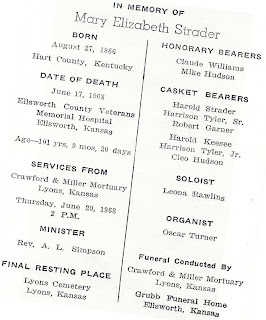 Even with the knowledge that Great Grandma was an educator my mother, having married into an “ex-slave” family, was no more fond of the Strader’s family traditions. One weekend, while in Lyons, we visited Great Grandma at her 5th St. house, which had great family memories. Her youngest three children were born in that home with no running water, and until her death in 1968, it still did not have running water. This bothered Mother, but us great-grandchildren loved the idea of being able to use the water pump outside the door even for baths. Baths were taken on Saturday in the kitchen, in the tin tub; once a week was enough for Great Grandma. The Saturday before the once-a- month church service was special. Once a month, a roaming African Methodist Episcopal (AME) pastor would come to Lyons and preach in the little white house, Grant AME Chapel, used as the”Lawd’s Temple.” All the “coloreds” from the several counties would come. Great Grandma would bake all day, preparing her famous German Chocolate cake or pound cake. Mother, with a Home Economics degree and Foreign Language degree would call the cakes “heavy, hard and always dry” in English, French and Spanish. This was in spite of the pound of butter used, but probably due to the fat cream she used instead of milk, said Mother. Daddy disagreed and would flush his big slice down with more milk. Often, after our special pre-church day dessert, Daddy would take us to the outhouse, wipe our behinds with pages from the Sears catalog, (toilet paper was a waste), and we would follow the path back to the house for one of Great Grandma’s stories of the homeland, in this case Kentucky. She was a great storyteller with no regard to the age of the child, so we were usually haunted by nightmares of people falling into open wells, and such. She on the other hand, would get a good nights sleep, for her “performance” in church, as mother liked to call it. 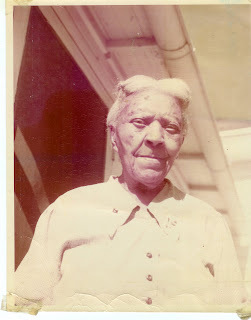 Although Great Grandma migrated to Kansas in around 1900, she still couldn’t say “Lord”, it sounded like “Lawd,” which she would proudly shout out with praises of Amen, and “Preach on, Lawd, preach on” as her black straw hat, regardless of the season, barely sat on top of all that thick hair. In 1966, Great Grandma got a letter from President Lyndon B. Johnson congratulating the Centurion. It was the same year she got family-diagnosed pneumonia, and needed care. Plus, children and grandchildren were fussing about her using the open fire in the kitchen. In spite of her protest, she was moved from Lyons, Kansas to Ellsworth to live with Great-Aunt Can where there was running water and indoor plumbing. She also enjoyed real coffee. Great-Aunt Can would make it on day one, on day two Great Grandma would add a few more grinds and water, and on day three just a few more grinds to freshen up the pot. And then start all over. I think Mother kept a calendar on the fresh pot coffee day. Keep in mind this had nothing to do with financial needs, Great-Aunt Can was a fairly well-to do widow. It was just one of her “peculiar ways” Mother would say. When I was eight years old Great Grandma died, after being in and out of the Ellsworth County Veterans Memorial Hospital. Having never been hospitalized before, we knew it was the end. She was at least 101 yrs, 9 months and 20 days old. 102 if you used her original birth date. Her service was in the little white church house in Lyons, where she used to praise the Lawd. And Mother proudly read her eulogy. What a life, what a history and what a story. Bet she heard a lot about the Civil War as well. Thanks for sharing here. BTW, the word verification is the easiest I've ever had, cooke. Thanks Barbara for stopping by. I love feedback. Luckily for me, I can share genealogical stories on my slave, Irish, German and free -colored branches of my personal families. It's due to this versatility that I love Genealogy research. Your great-grandmother sounds like an absolute treasure! Don't you love the individual qualities our ancestors have that allow us to tell interesting stories?! Thanks for sharing.